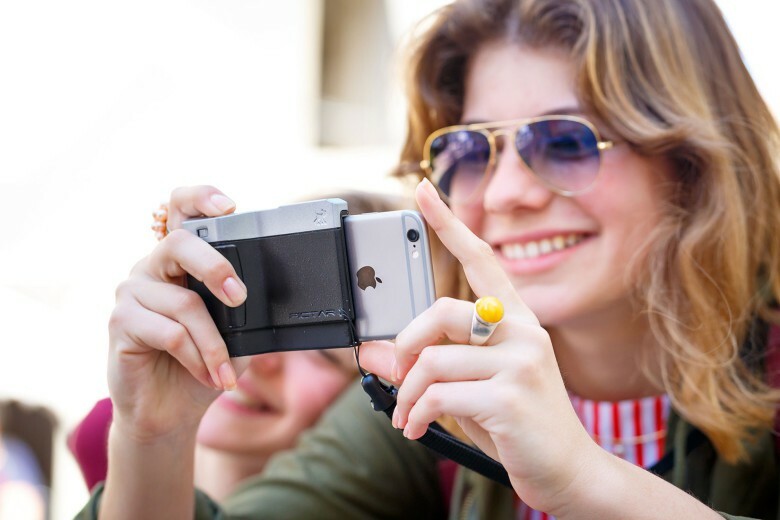 Pictar eliminates the worry of dropping your iPhone while making pictures. The more I grow to love photography with an iPhone, the more I miss certain things about conventional cameras. Get a grip, you say? A grip is one of the things I am talking about. miggo, innovative makers of camera bags, straps and mounts, brings to Kickstarter the Pictar, an ergonomic camera grip for the iPhone that also shifts cumbersome menu functions to five programmable wheels and buttons right at the tip of your shooting finger. 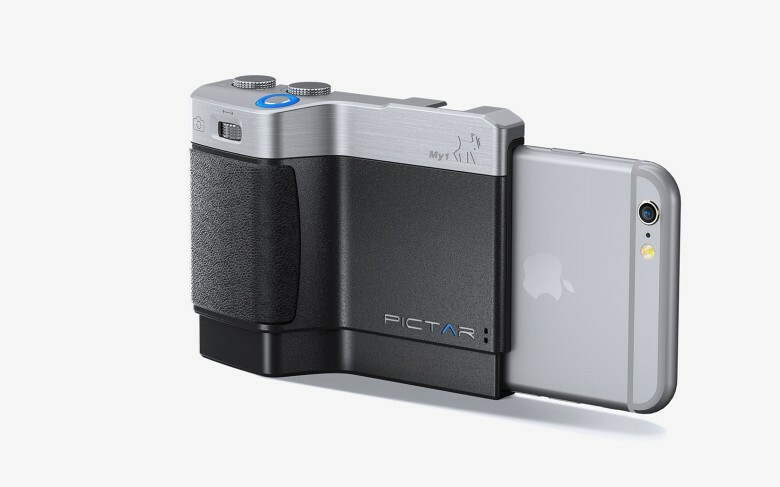 Pictar offers a conventional grip and DSLR controls without complicating your iPhone photography. We love the touch of a sleek iPhone and while its design is something to behold, holding it to make photos is perilous at best. Perhaps the best feature of the iPhone, its camera, puts the user in the most vulnerable position to drop their device. To do so, Pictar starts with a grip that offers a natural spot on which the fingers wrap. A serious photographer doesn’t want to keep their iPhone pocketed so an optional wrist or neck strap invites and allows the user to keep the camera, secure, out and ready. Keep your iPhone’s camera at the ready. We love the iPhone for photography because we don’t have to concern ourselves with buttons and wheels to control the camera. Pictar makes the case for some of this hardware to bring greater and faster control of the camera from the menu to your fingertips. With a little practice, those control will become second nature. A companion app communicates with the Pictar, using patented high-frequency tones for each function you want to set to it. Don’t worry, the frequencies are so high, your hearing won’t detect the sounds. This technology allows the user to keep the Bluetooth off and slow the drain on the battery. The marquee feature is a shutter button that allows the user to pre-focus by partially depressing the shutter. A full press of the shutter makes the picture without delay. Below the shutter is a zoom ring, eliminating the need to make a pinching motion on your iPhone screen. If you need to make a selfie, click the zoom ring to switch between the iPhone’s front and back cameras. On the back of the Pictar grip is an exposure compensation wheel that lets you easily adjust the range between light and dark. Another smart wheel lets you pick your favorite function, whether its preset modes like portrait or macro settings or manual controls, like adjusting the camera’s shutter speed. miggo estimates Pictar will function for six to eight months on a single AA battery. The Kickstarter campaign went live today and the Pictar is available for an introductory price of $90. Full retail ability is slated for December.